South Palms Resort – where elegant accommodation, nature’s beauty and delectable cuisine meet. With the longest white sand beach on Panglao Island, classy garden rooms and beach villas, and incredible farm-fresh cuisine, South Palms Resort Panglao, a new beach resort in Bohol, Philippines, beckons luxury travelers to experience “the way a Bohol beach holiday should be.” South Palms Resort Panglao occupies the site of what was once the larger half of Bohol Beach Club, which still exists as a separate resort next door. Composed of 90 deluxe rooms and villas, South Palms Resort Panglao is laid out on a landscaped garden and two swimming pools: one an infinity pool fronting the restaurant, and the other, a deeper pool set beneath the shade of coconut palms amidst the eastern bungalows. I stayed at a deluxe view room behind the East Pool. The room was a warm and elegant affair, definitely classy without being high-brow or pretentious. As for the customer service, the resort staff was friendly, accommodating and helpful – a testimony to Boholano hospitality. South Palms Resort Panglao boasts of the longest beach on Panglao Island, Bohol! Besides its exceptional customer service, the beach resort takes pride in its gourmet cuisine made from farm-fresh ingredients raised at their own local farms on mainland. They grow their own tiger prawns, tilapia, pompano, sea bass and bangus (milkfish). They also produce their own chicken and pork. The resort’s restaurant, Oceanica offers a delicious array of Filipino and Western dishes, made all the more delectable by these locally grown meats and fishes, for both guests and walk-in diners. While every dish they served during our stay was a delight, my favorites were grilled prawns with aligue (crab fat) sauce, kare-kare (oxtail stew) and seafood pesto. Sure, South Palms Resort has elegant amenities and impeccable food. But nothing else sets it from other resorts on Bohol other than its 750 meter stretch of natural white sand – the longest beach of any resort on Panglao Island! What’s more, the south-facing shore of fine and soft sand offers both wonderful sunrises and sunsets. The natural beauty of Panglao Island extends far beneath the water’s surface, however. There are numerous dive sites ripe for underwater adventures off Panglao Island and along smaller islands nearby like Pamilacan and Balicasag. South Palms Resort Panglao offers scuba diving lessons and trips through its official diving partner, Emerald Green Diving Center, which has 17 years experience offering scuba diving trips in Cebu and Bohol. Balicasag Island Marine Sanctuary, located 45 minutes by boat from Panglao Island, is a world-class dive site with vibrant corals, colorful reef fishes, sea turtles and the seasonal hammerhead shark. The 30 to 45 minute habal-habal motorbike or tricycle ride from the Port of Tagbiliran or Tagbilaran Airport to South Palms Resort Panglao would cost PHP 250. Or you may arrange a van pick-up with the resort. This trip was made possible by Visit Bohol 2014, a media tour held from December 17 to 19, 2013. The event was organized by the Department of Tourism, Province of Bohol, Bohol Tourism Council and USAID-Compete to help revitalize and rehabilitate the tourism industry in Bohol, Philippines. I’m back from my travel blogging hiatus and your blog is among the first that I opened in 2014. Great post about Panglao indeed. It will really go a long way towards the revival of the tourism industry of Bohol after the earthquake. Hi Edelito, welcome back! Thank you very much for visiting my blog after your hiatus. Yes I do hope Bohol will be rebuilt and rehabilitated with the help of tourism. 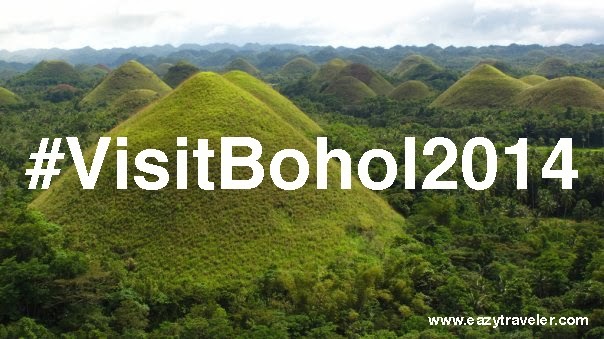 Do visit Bohol in 2014!